How to find out what version of AS/400 (IBM iSeries) Operating System you have installed. Home » How to find out what version of OS/400, AS/400 (IBM iSeries / IBM i) Operating System you have installed. How to find out what version of OS/400, AS/400 (IBM iSeries / IBM i) Operating System you have installed. There may be more than one way of doing this but this is how I would do it…. In the above example the second block of characters on the top line of the spool file is the version of OS/400 currently installed. In this case V5R4M0 which means Version 5 Release 4 Modification level 0 commonly known as OS/400 5.4. 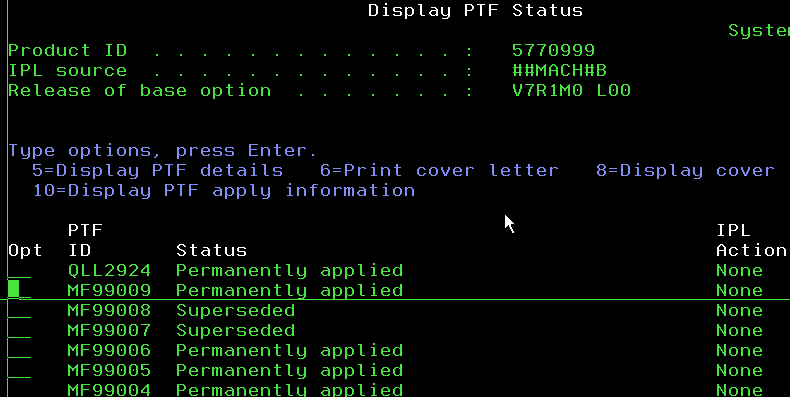 Thanks to Jose for leaving a comment below pointing out that the DSPPTF (Display Program Temporary Fix) command is probably the best way to find the version of IBM i / AS400 operating system you have installed. The original method shown above will work with minimal access rights but if you have access to the DSPPTF command then best to use this instead. 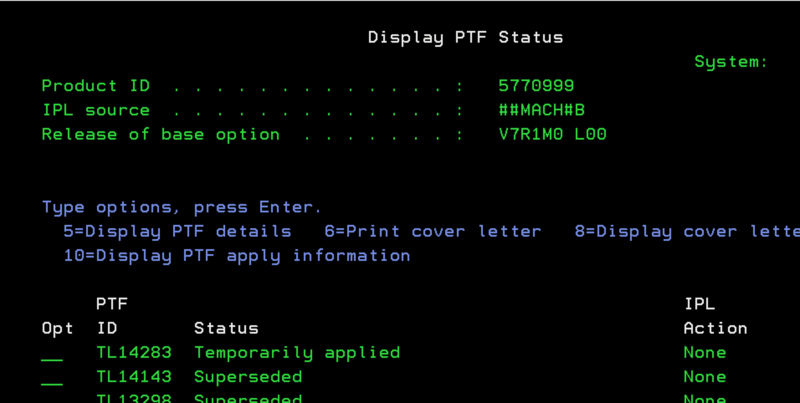 In the example shown below the machine is running OS/400 Version 7 Release 1 Modification Level 0. How to find what Tech Refresh (TR) is installed? It is worth noting that from OS/400 7.1 IBM decided to increase the frequency between actual OS point upgrades e.g. from 7.1 to 7.2 as these can be costly and disruptive to perform. At the same time IBM wanted to be able to accelerate the pace at which new features are added to OS/400. So from 7.1 IBM have now added the concept of “Tech Refreshes” (TR). In other words not all 7.1 and 7.2 systems are equal you now need to know the OS/400 version AND the TR level to know if a particular feature is available. This system has OS/400 7.1 Tech Refresh (TR) 9 installed, and you can see below it that TR8, 7, 6, 5, 4 etc were previously installed. a better way to display OS version on iSeries: DSPPTF.